Redshirt freshman Salamo Fiso (left), pictured with Carl Bradford, began his emergence as a starting linebacker for the Sun Devils during bowl practices in 2012. TEMPE, Ariz. — Arizona State had a little fun Sunday amid preparation for the Holiday Bowl, pitting senior defensive tackle Will Sutton and senior left tackle Evan Finkenberg against each other as coaches in a scrimmage of the team’s younger players while veterans and starters watched from the sidelines. The exercise, which elicited plenty of good-natured trash talk, wasn’t all about fun, though; it was also about necessity. 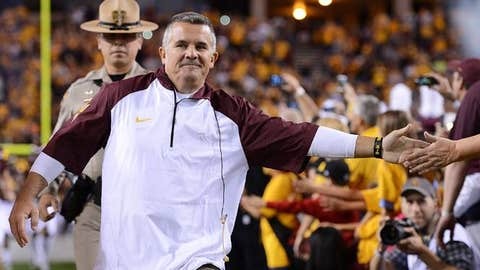 The young players need the work with ASU facing significant personnel losses. With at least 11 starters gone after the season, ASU’s bowl practices provide an opportunity even more crucial than they were a year ago to start developing young players who may be stepping into big roles next season. “These guys have got to get ready to go, and you can tell they’ve got a sense or urgency about working,” ASU coach Todd Graham said. “We’ve got a lot of big shoes to fill, but I’ve got all the confidence in the world that our guys (can do it). Our goal is to be better. Bowl teams get as many as 15 extra practices after the season ends. Given its appearance in the Pac-12 title game and a three-day break for Christmas, ASU won’t use all of those ahead of its Dec. 30 game against Texas Tech, with eight practices in Tempe and a few more in San Diego. Last season’s extra practices ahead of the Kraft Fight Hunger Bowl provided the same opportunity for ASU to start working more closely with younger players, getting a head start on their development. But with a loaded class of veterans and starters returning, there was less sense of urgency. But in 2014 ASU faces drastic lineup changes, particularly on defense, so taking stock of talent, evaluating and developing has become a high priority. The defense loses linebackers Chris Young and Anthony Jones, defensive linemen Will Sutton, Gannon Conway and Davon Coleman, cornerbacks Robert Nelson and Osahon Irabor and safety Alden Darby. There’s also the potential for linebacker Carl Bradford to leave early for the NFL. On the offensive side, ASU loses starters Finkenberg, center Kody Koebensky and running back Marion Grice. A thin junior class makes replacing senior starters more difficult, as many players from the 2011 recruiting class have left the program. There has also been some attrition from the 2012 class, which Graham and his staff put together in the month after he was hired, in many cases retaining recruits committed under Dennis Erickson. Graham says ASU’s expectation is to keep improving. Doing so in 2014 will require significant contributions from new starters, and this is their time to start taking the next steps. 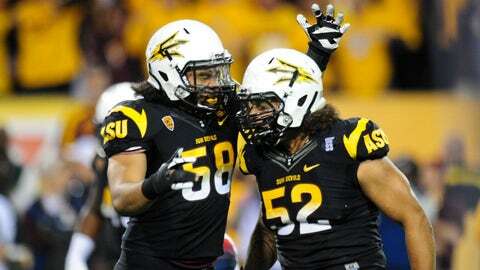 Perhaps ASU’s best current example of the significance of bowl practices: redshirt freshman linebacker Salamo Fiso. Fiso redshirted last season but progressed enough in bowl practices, spring practice and fall camp to start 10 games this season. Fiso said the extra bowl practices played a big part in his development. Others benefiting from the extra work ahead of a bowl game in Graham’s first season included junior right tackle Tyler Sulka, who won the starting job in the fall, and sophomore receiver Richard Smith. Offensive line coach Chris Thomsen can also attest to the value of bowl practices. He led Texas Tech’s bowl practices as interim head coach last season. Thomsen doesn’t just have to determine replacements for Finkenberg and Koebensky. He must also determine depth and other line adjustments as a result of those losses. Left guard Jamil Douglas could move to tackle. Sulka could move inside. Room will be made for highly touted transfer Christian Westerman, likely at guard. The groundwork of such moves — offensive line and otherwise — begins now, Thomsen said. ASU’s first three bowl practices featured an hour of preparation for Texas Tech, after which veterans and starters were allowed to leave. The next hour was dedicated to working with the younger players. The next three practices will be the same. Among the players who could benefit most from this year’s bowl practices are freshman safety Marcus Ball, sophomore tackle Evan Goodman, guard Stephon McCray, linebacker Antonio Longino and safety James Johnson. — Graham confirmed over the weekend that Westerman, a sophomore who came to ASU last season from Auburn, is eligible to play in the Holiday Bowl because he was a mid-year transfer. It is unclear, however, if he will see any action. — Cornerback Robert Nelson has been away from the team for all three of its bowl practices thus far following multiple deaths in his extended family. He is expected to return this week.